A full list of PT part numbers, models and descriptions. Load Measurement Pins made to your specifications, this is your starting point. 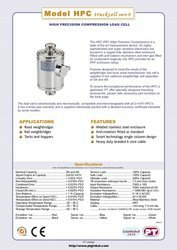 Brochure for PT100SA surge arrestor. Manual for general operation of PT200X indicator. Data sheet for the PT272 indicator. Brochure for PTSSP6-AW Welded Stainless steel single point. Brochure for PTSSP6-E Stainless steel single point. Brochure for PTSSP6-F Stainless steel single point. Brochure for PTSSP6-G Stainless steel single point. Brochure for PTSSP6-Q Stainless steel single point.